Italian Pastore Maremano Abruzzese, Maremma, Cane da Pastore, Maremmano-Abruzzese, Pastore, Abruzzese, Cane Da Pastore Maremmano Abruzzese, Pastore Maremano Abruzzese, Abruzzese Shepherd Dog, Abruzzenhund, Cao Pastore Maremano da Italia. The Maremma Sheepdog breed originated in Central Italy and is a rare type of working dog, some say it has been bred for over 2000 years in the High Appenines and plains of the Abruzzi region. This dog is a flock guardian friendly and well balanced Sheepdog Breed having also achieved success as a pet dog for several decades but there primary function was to guard the flocks and property of the shepherd especially from wolves and bears that are still to be found there and also from thieves and bands of stray dogs. This dog is loyal, courageous, determined and does an excellent job being a guard dog without barking constantly. As they are bred and trained to be independent they will not follow your commands very easily. In order to make them listen you must be calm, be firm demonstrating a consistent and confident leadership in order to make them obey and be heard.They are very smart and training requires mutual respect in handling and voice, and above all, consistency. They go along well with other dogs and pets and can be somewhat reserved with strangers. People who are not welcome will be put off and stopped short. As pets they are not very attached or too outgoing. However, this sturdy breed wolf-slayer has established to be great companions, without losing their extraordinary capacity for work. They defend the house and master, and are particularly attentive with young children. The Maremma sheepdogs are marvelous and love their job. They are a terrible enemy of wolves, but are tame with Man. Held in the high esteem pastors, especially in the snowy mountains, resistant to cold and bushes. But do remember this is not a breed for beginners. 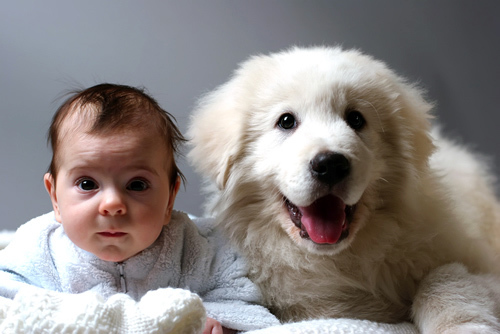 - Click here to know even more about the Maremma Sheepdog Breed.